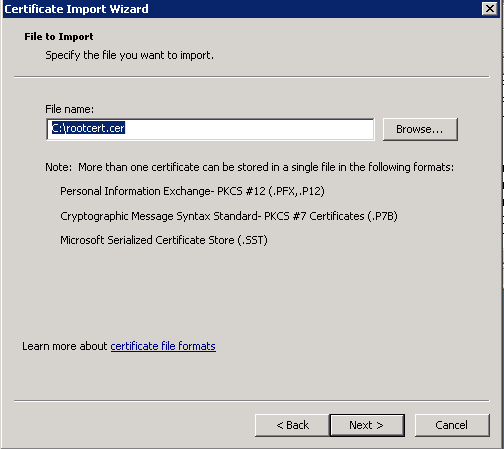 In Part 1 and Part 2 of this series, I explained how to request and import a root certificate from your internal CA and then how to create a new SCOM Certificate Template and publish that into your CA Templates folder. 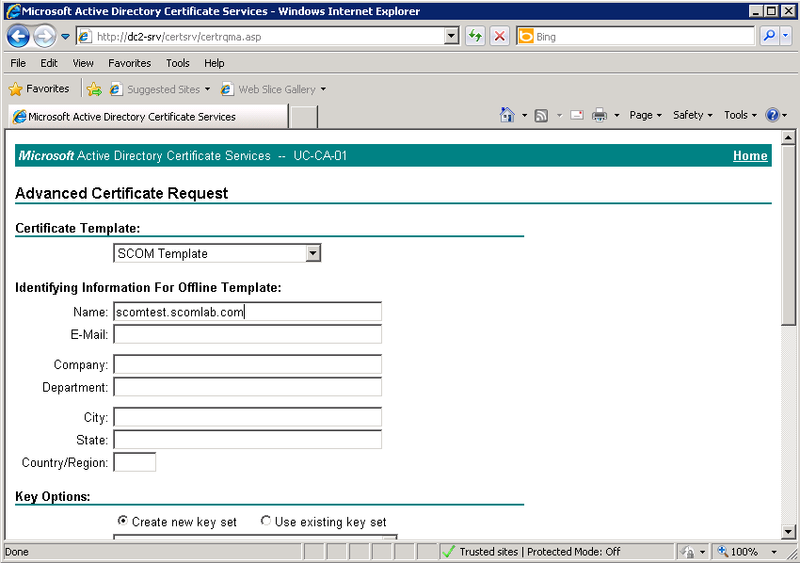 In this part of the series, I will detail how to request a certificate from your Certificate Authority using the newly created SCOM Template and then I will also explain how to import that certificate into the requesting server's 'Local Computer - Certificate' store. Log on to the computer where you want to request a certificate – e.g. RMS, MS, Gateway server or untrusted domain server. 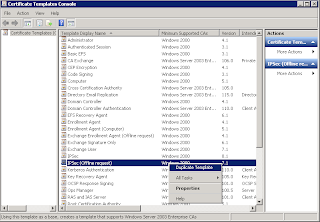 Firstly, you need to ensure that you can ping by using FQDN, the SCOM Management Server from the untrusted domain /DMZ or SCOM Gateway server and then also you must be able to ping the untrusted domain / DMZ or SCOM Gateway server from the SCOM Management Server too. 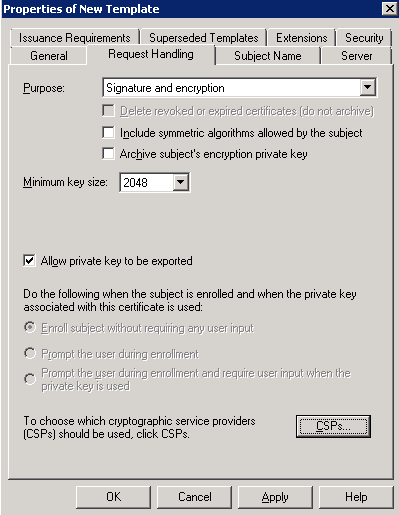 You may need to use static host entries on the local computers to achieve this but it is imperative that this step is complete before moving onto the next steps. 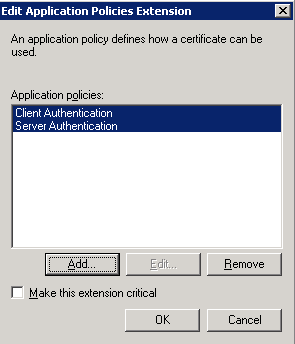 On the Microsoft Certificate Services Welcome page, click Request a certificate. 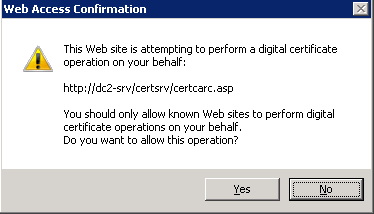 On the Request a Certificate page, click Or, submit an advanced certificate request. 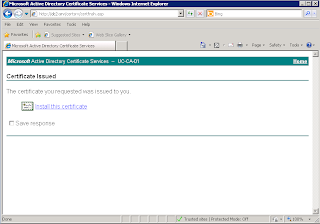 On the Advanced Certificate Request page, click Create and submit a request to this CA. To resolve this issue, open Internet Explorer properties and go to the ‘Security’ tab, then click on ‘Trusted Sites’ and then select the ‘Sites’ button. 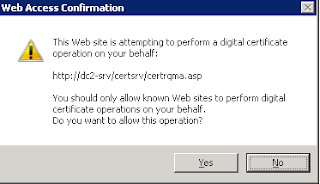 Add the http://<servername>/certsrv URL to the ‘Trusted Sites’ Websites list and un-tick ‘Require server verification (https:) for all sites in this zone’ – This step can be omitted if your URL is published on https instead of http however. 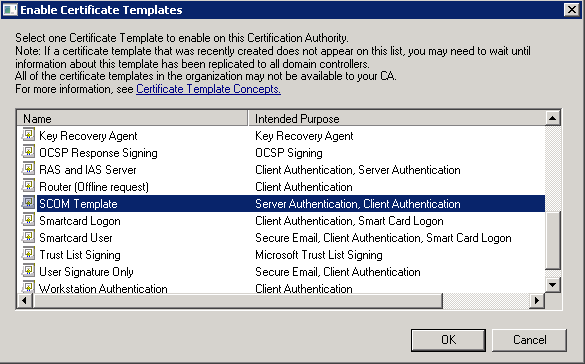 From the next window, again select the ‘Advanced Certificate Request’ option and then selec the ‘Create and submit a request to this CA’ option from the next window again. 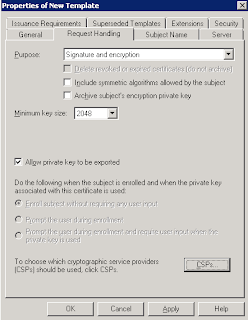 Once you have entered all of the information required and are happy to proceed, click the ‘Submit’ button at the bottom of the page to finish the request. 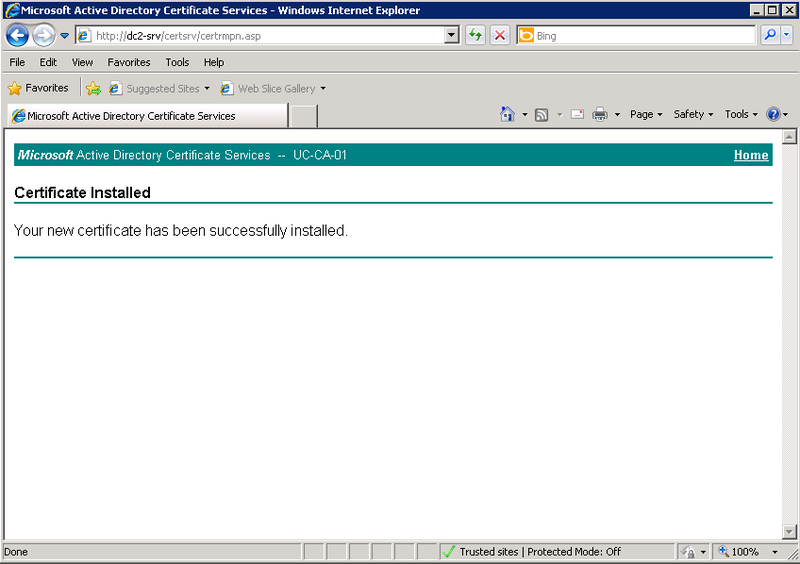 You should see a window like this to confirm the new certificate has been successfully installed....or so you might think! 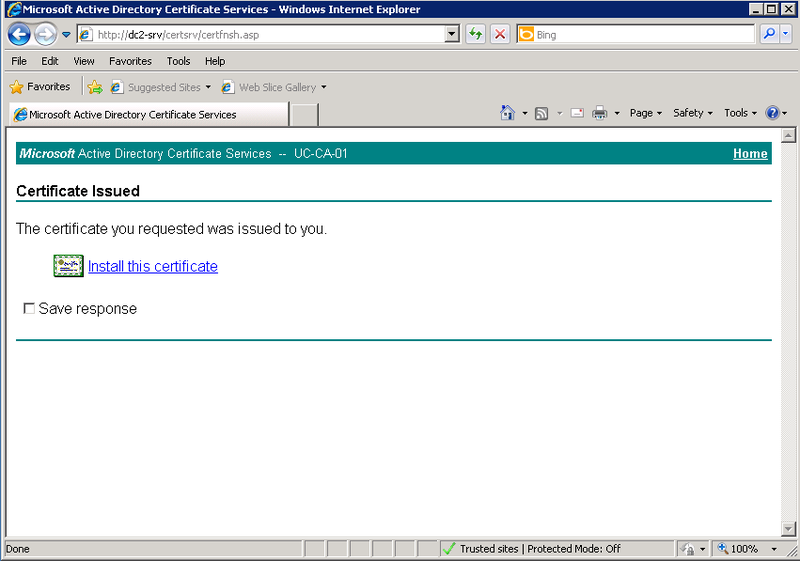 Although the screen above states that your new certificate has been installed onto your computer, you will find that if you open the ‘Certificates’ MMC snap-in for ‘Certificates (Local Computer)’, there is no sign of your newly created and imported certificate!!! 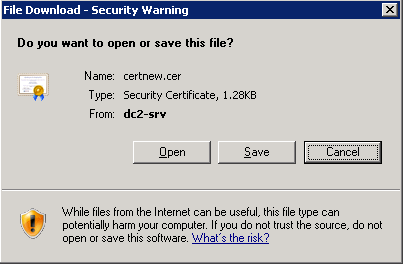 Thankfully, there is a pretty simple solution to this. 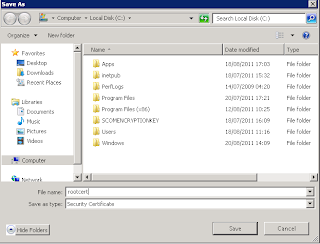 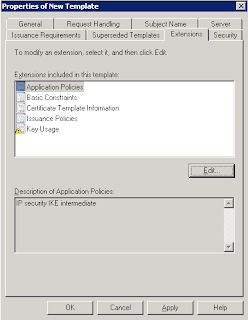 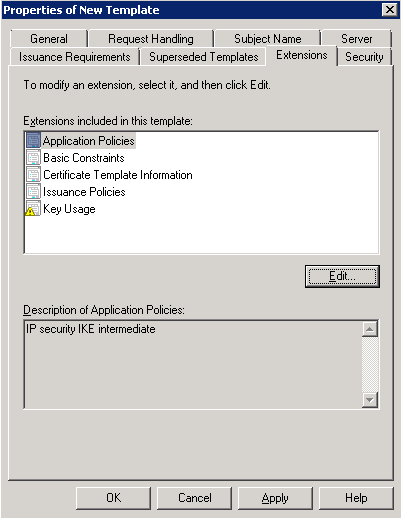 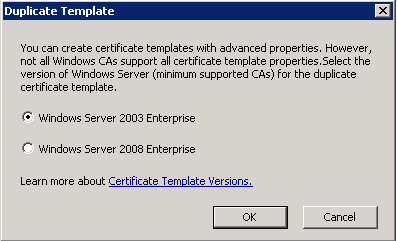 The problem occurs because the certificate template creation within Windows Server 2008 doesn’t have provision to specify where exactly the certificate will be stored when you ask it to ‘Install This Certificate’. 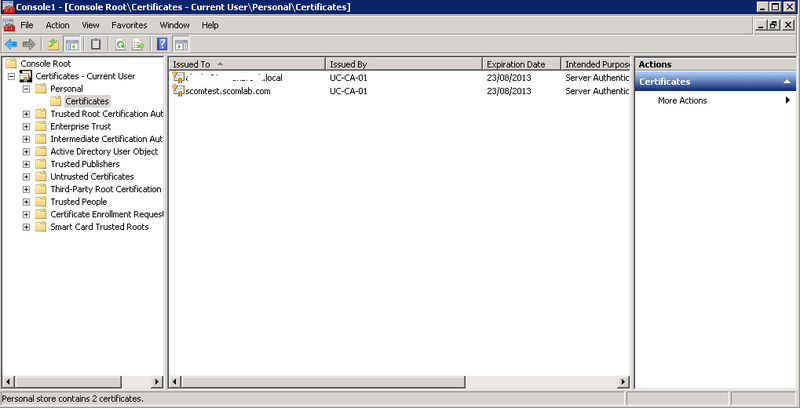 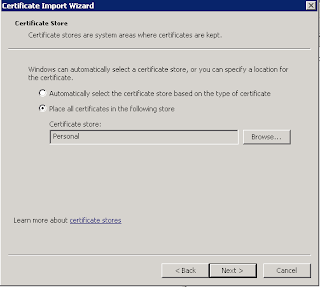 It automatically installs the new certificate into the Certificates MMC Snap-In under the ‘Certificates – Current User’ window instead and not the ‘Local Computer’ option as we would like! 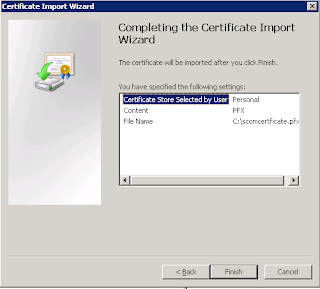 All we need to do here is to export this certificate from the ‘Certificates – Current User’ store and import it into the ‘Certificates – Local Computer’ store to enable SCOM to use it for authentication of the computer. 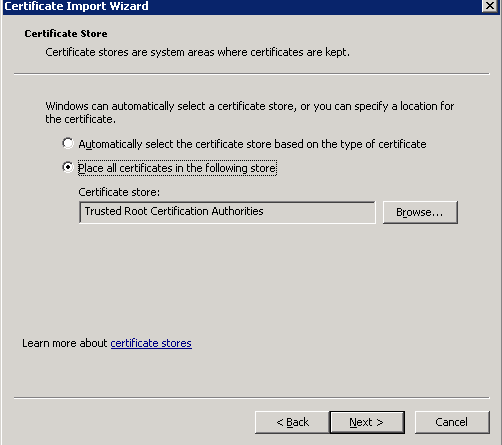 Update: If you open both certificate stores in the same MMC snap-in window, you should be able to just drag and drop the certificate from ‘Certificates – Current User' to ‘Certificates – Local Computer’. 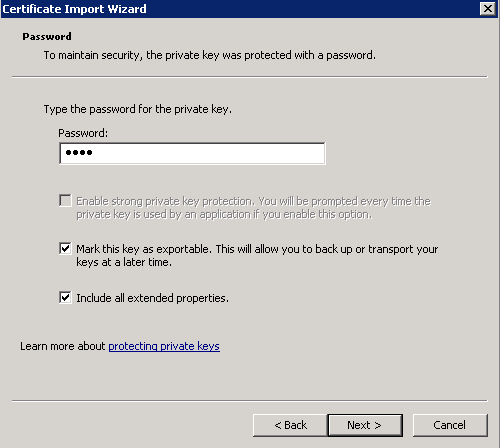 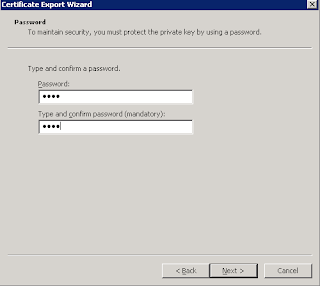 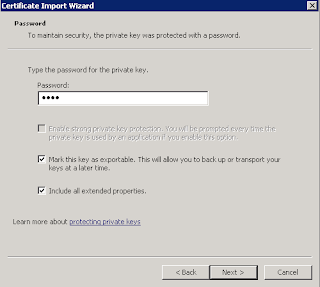 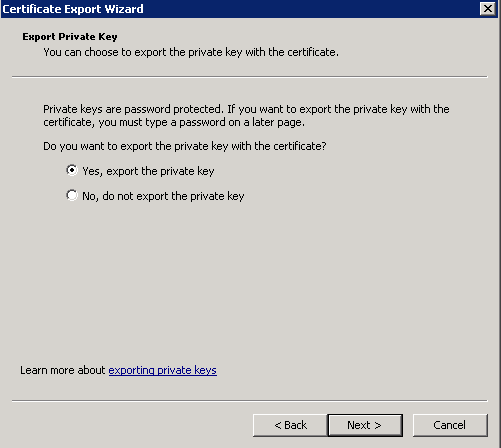 This will also retain the private key and should help you avoid the additional steps below using the Certificate Export Wizard. 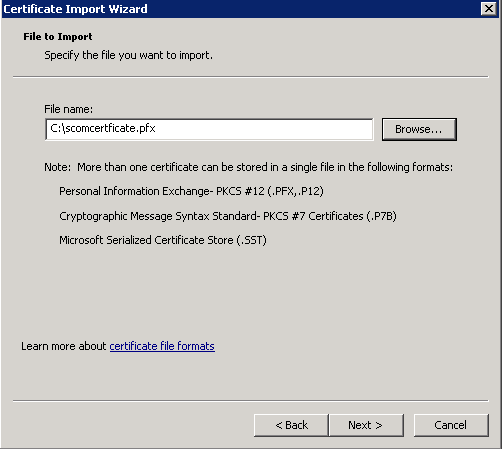 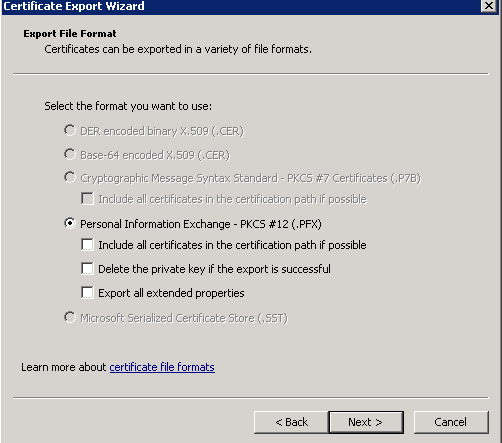 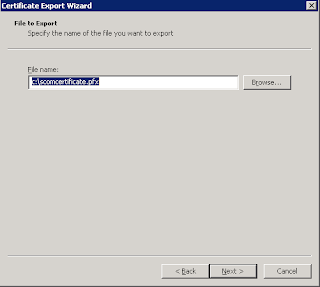 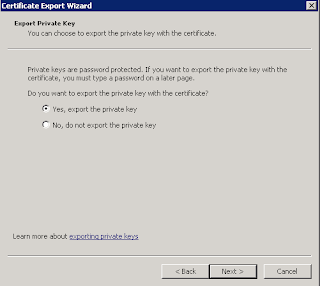 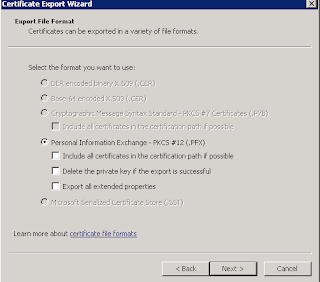 Now click through the ‘Certificate Export Wizard’ to export the certificate and its private key to a location on your C:\ drive. 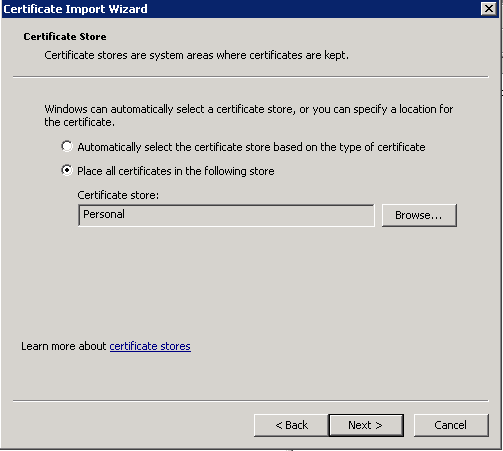 This completes the certificate request using the SCOM Certificate Template and the certificate export-import into your Windows Server 'Local Computer - Certificates' store. 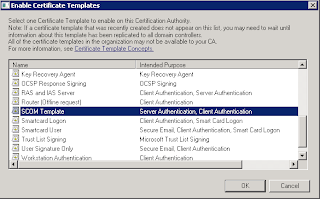 In the final blog post (Part 4) of this series, I will explain how manually install the SCOM agent, update it to the latest Cumulative Update and then how to import the certificate into SCOM to use for authentication when monitoring the SCOM Gateway, untrusted domain/DMZ servers. 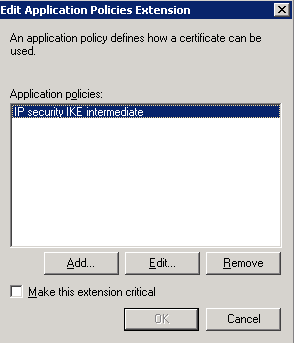 In Part 1 of this series, I explained how to download and import the Trusted Root Certificate Authority root certificate onto the server that you want to use internal PKI authentication with from within your SCOM environment. 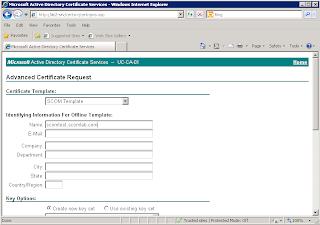 In this part of the series, I will detail how to create a certificate template within your Windows Server 2008 Certificate Authority which will make it very easy later on to create a certificate request from your SCOM RMS, MS, Gateway or untrusted domain/DMZ servers. 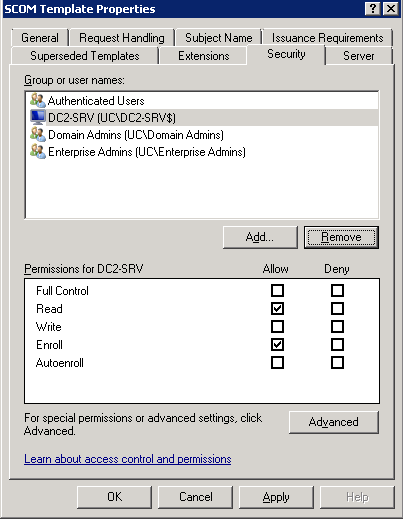 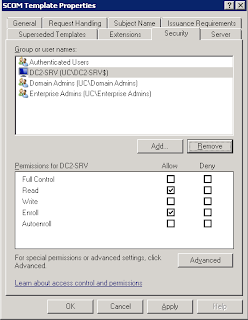 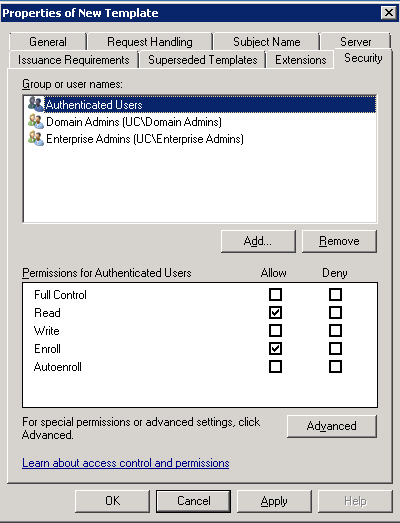 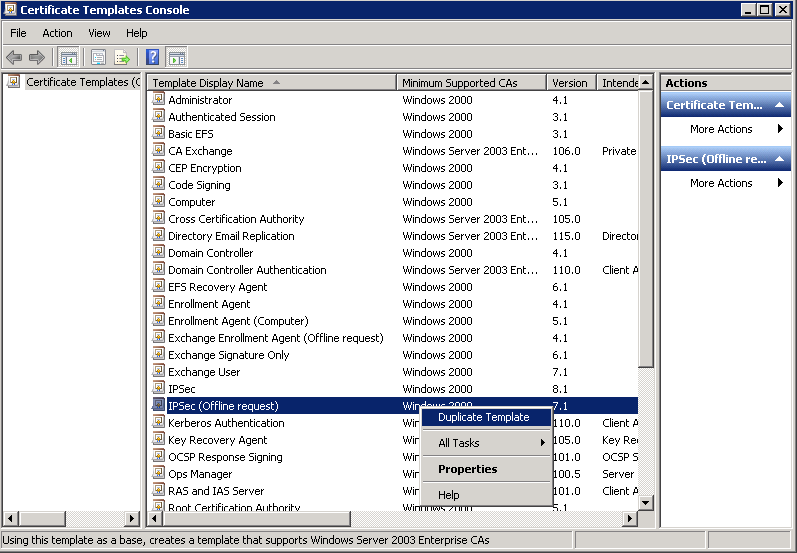 On the computer that is hosting your enterprise CA, from the Windows desktop, click Start, point to Programs, point to Administrative Tools, and then click Certification Authority. 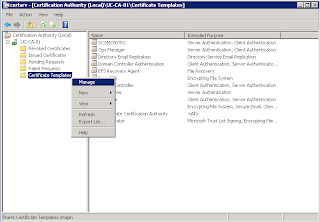 We now must add the 'Computer' object for the Certificate Authority to have 'Read and Enroll' permissions within the Security tab. 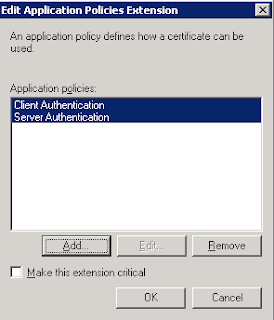 This is an additional step that is necessary when using a Windows Server 2008 R2 Certificate Authority due to additonal security requirements. 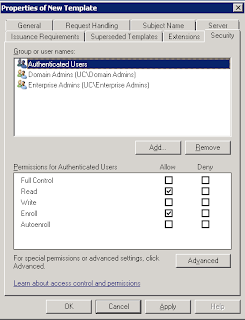 Once we have created the SCOM Template and configured the correct permissions, we now need to add that template into the Certificate Authority 'Templates' folder for it to be viewable as a template by clients. 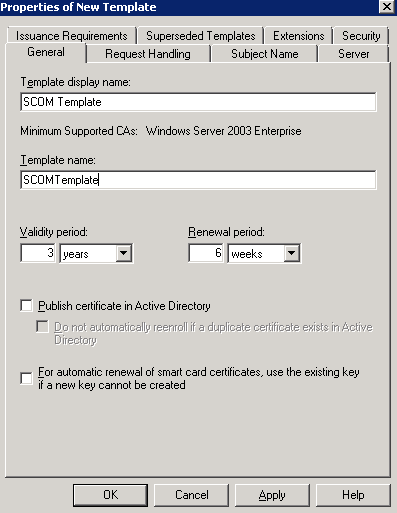 This will now enable the new ‘SCOM Template’ certificate template that you created previously and allow it to be used when requesting future certificates for SCOM through the Certificate Authority Web Browser enrolment tool. 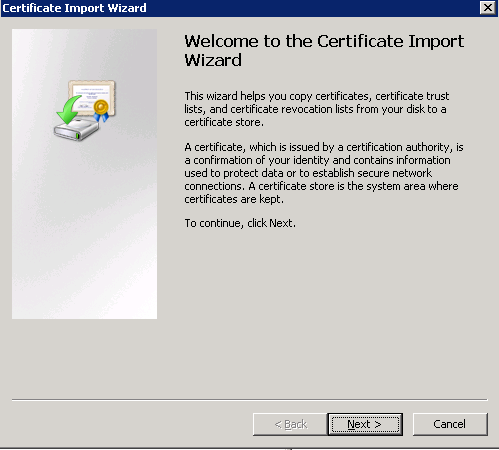 That concludes part 2 of this blog series. 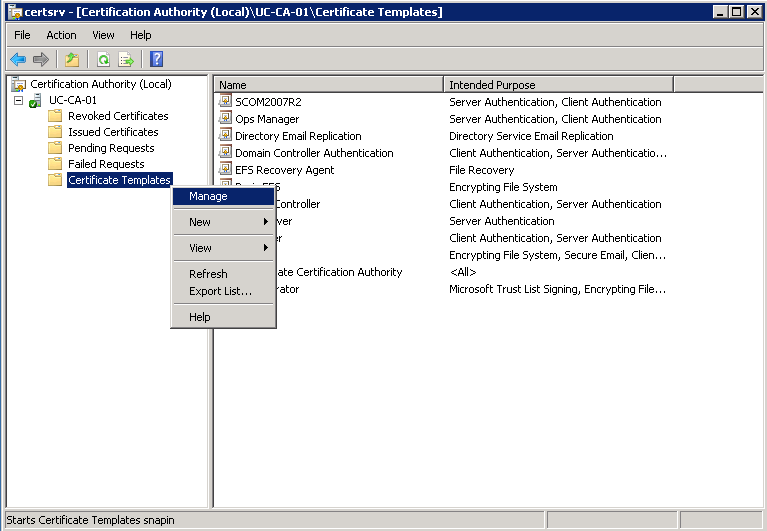 In Part 3, I will explain how to request a SCOM certificate from the Certification Authority using the newly created SCOM Template and then how to import that certificate into the 'Local Computer - Certificate' store on the requesting server. 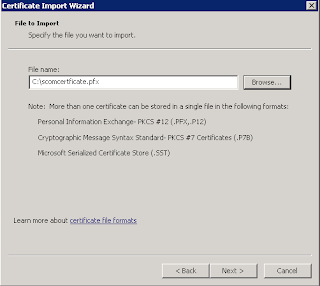 A while back I wrote a series of blog posts around using Public Certificates with SCOM - 'Using Public Certificates With SCOM Part 1' - and thought that it wouldn't be a complete overview of using SCOM with certificates unless I covered the use of an internal PKI infrastructure too. 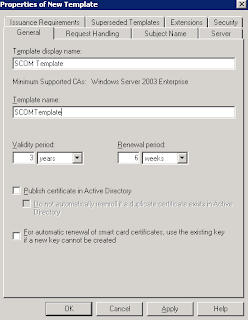 The following few posts are based on my experiences of using SCOM with an internal Certificate Authority on Windows Server 2008. 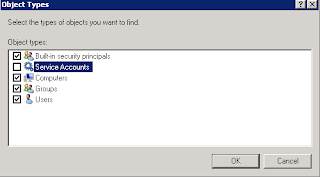 I have broken each post down into separate sets of tasks that need to be completed as you move through the process to make things easier to follow. In this first part of the series, I will be focusing on downloading and then importing the Trusted Root Certificate Authority (CA) certificate to the server(s) that you want to use certificate authentication with. 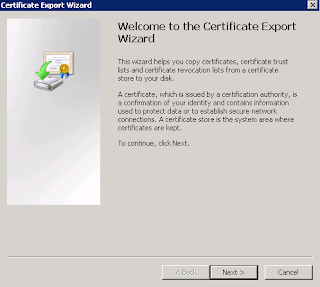 Log on to the computer where you want to install a certificate – e.g. 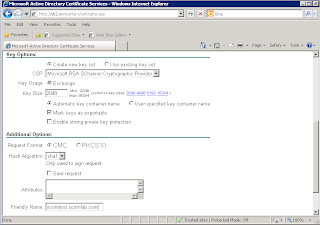 RMS, MS, Gateway server or untrusted domain/DMZ server. 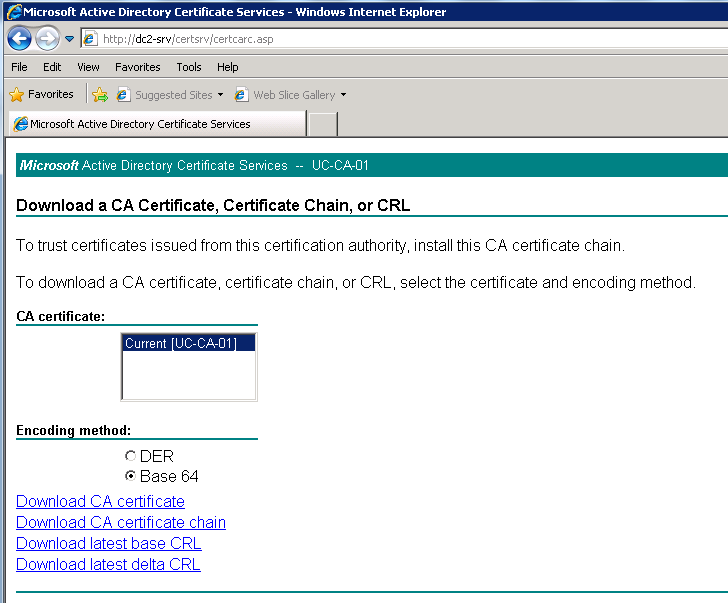 On the Welcome page, click Download a CA Certificate, certificate chain, or CRL. 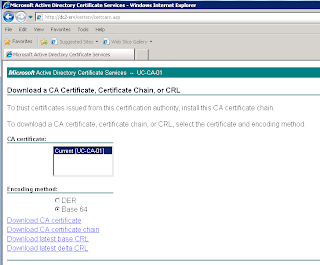 On the Download a CA Certificate, Certificate Chain, or CRL page, click Encoding method, click Base 64, and then click Download CA certificate chain. Add the - http://<servername>/certsrv - URL to the ‘Trusted Sites’ Websites list and un-tick ‘Require server verification (https:) for all sites in this zone’ – This step can be omitted if your URL is published on https instead of http however. 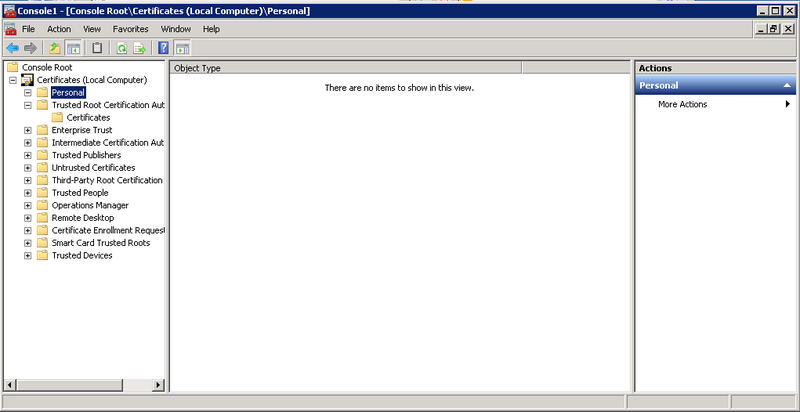 When the download has finished, close Internet Explorer. 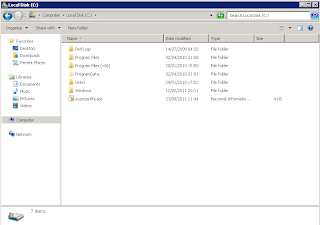 In the Console1 window, click File, and then click Add/Remove Snap-in. 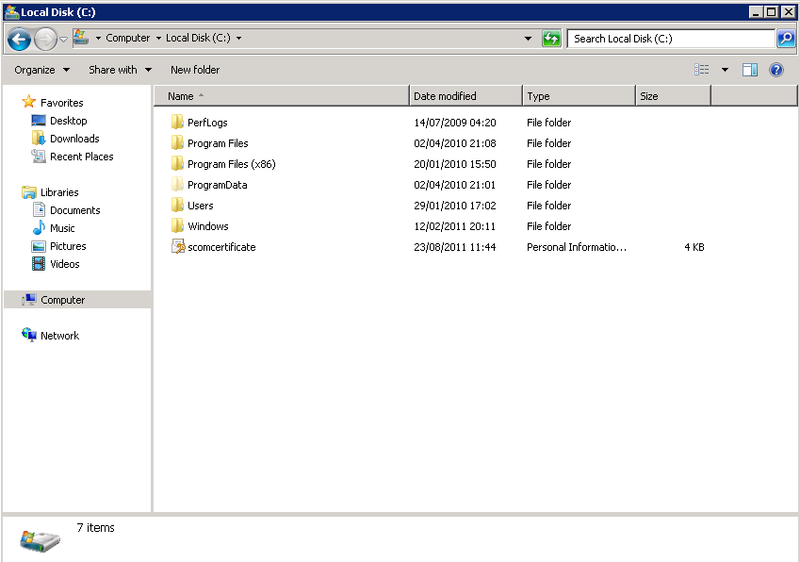 In the Select Computer dialog box, ensure that Local computer: (the computer this console is running on) is selected, and then click Finish. 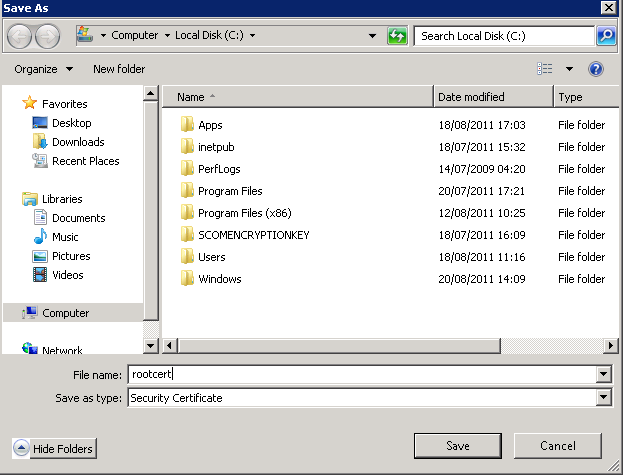 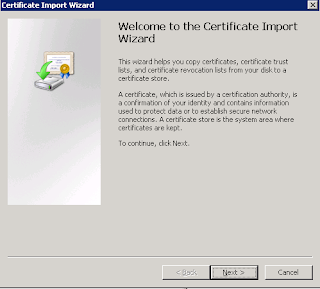 In the Console1 window, expand Certificates (Local Computer), expand Trusted Root Certification Authorities, and then click Certificates. 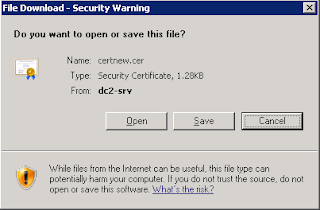 On the File to Import page, click Browse and select the location where you downloaded the CA certificate file, for example, c:\rootcert.cer, select the file, and then click Open. 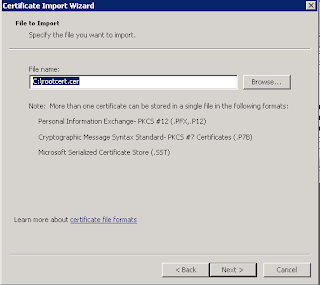 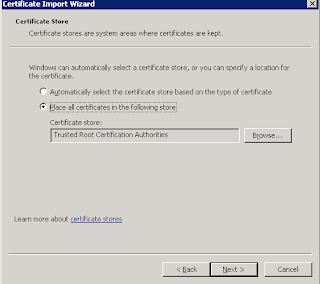 On the 'File to Import' page, select Place all certificates in the following store and ensure that Trusted Root Certification Authorities appears in the Certificate store box, and then click Next. 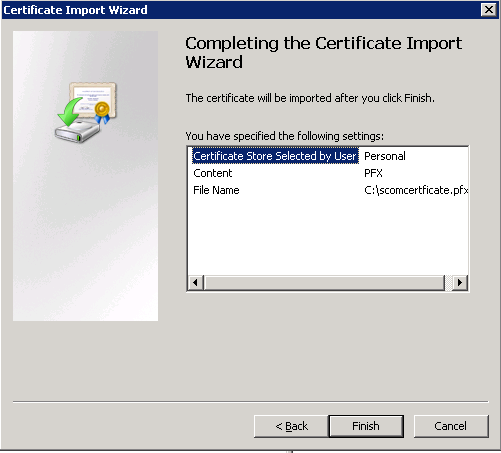 On the 'Completing the Certificate Import Wizard' page, click Finish to complete the process. 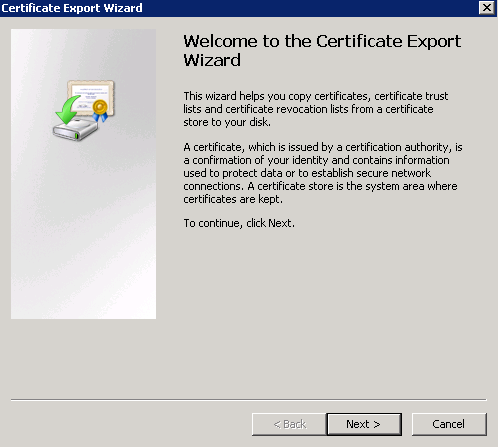 At this point you should now have the Trusted Root CA certificate downloaded and installed onto your server and ready to move onto the next step. 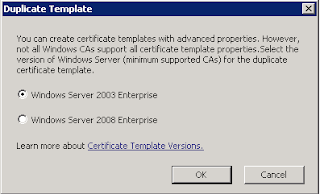 In Part 2 of this blog series, I will explain how to create a certifcate template within the Windows Server 2008 Certification Authority that can be used by your servers that you want to monitor for nice and simple certificate requests from the CA.